Canadians woke up a little ashamed on Thursday in the aftermath of the riots in Vancouver. We are usually considered so “nice” and “polite” after all. The really sad part is that globally it isn’t Vancouver, but Canadians in generally, that are taking the heat for this fiasco of crazed behaviour. To be frank, Vancouver had a big public sore loser tantrum forever memorialized on the internet. This is no small public relations gaff for a city that recently hosted the Olympics, and is an international player culturally. We can learn from this. It was not the majority of citizens who perpetrated this atrocity. It is however a larger group that is attempting to recover and compensate for the mistakes made. Can these efforts assist in the public relations recovery? Private citizens have taken to the streets to clean up. People are making concerted and public efforts to thank the police for their efforts to control the violence. I was so ashamed of those criticizing the police for not anticipating/controlling the crazy mob. It was the worst kind of flash mob activity and clearly caught them by surprise. I mean, who expects nice Canadians to behave this way? 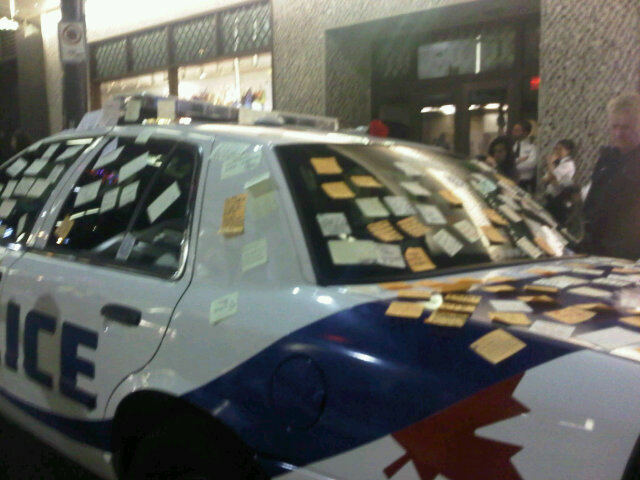 The photo I’ve added is of a police car covered in thank you notes from the citizens of Vancouver. This morning we wake up to the media covering the clean-up efforts. We are happy to have an opportunity to see the best in Vancouver. We are happy to publicize better behaviour. When someone, or a group, makes a mistake we seek the opportunity to acknowledge the apology and forgive so we don’t have to be ashamed or angry any more. We actually feel a bit of relief. Whether it is Vancouver hockey fans, or Maple Leaf meat products, or Bill Clinton, it is indeed possible to recover from a public relations catastrophe. Yes you will lose a few fans but there will be others who are loyal; and even a few who weren’t fans who will see the value of your efforts to make amends. They will see the true integrity of the city of Vancouver and understand that it was those bad apples that tarnished the reputation and not the policy of the majority, or the organization. We must find it in our hearts to be proud of those assisting in the public relations recovery. We must promote the idea that today is a new day with new opportunities to redevelop the relationship. The city of Vancouver may have a little egg on its face, and I’m sure their tourism team is working furiously to overcome this challenge; but we can’t hold a PR grudge or remain bitter. We can’t ignore this apology. That’s just rude. As quickly as social media spread the word of this heinous behaviour, we can use social media to get the word out that Vancouver understands its mistake. We can spread positivity just as easily, even though it won’t make the headlines in the same way. It just takes more effort. The criminals are being caught through identification on FaceBook and other social networking sites. People want to do the right thing and want to talk about it. My hat is off to those citizens who are moving through their shame to create a better Vancouver, my birth place. In business, as in life, reputation recovery is possible if the heart, and social media, are willing. This entry was posted in Communications, Media Impact, Social Media and tagged canucks, facebook, forgiveness, nhl, photos, police, public relations, reputation, riots, social media, thank you, twitter, vancouver. Bookmark the permalink.